I'm on a gnocchi roll this week. 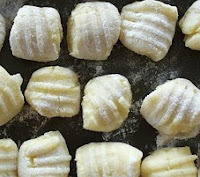 Gnocchi are so easy to make, there's no excuse for discarding any less than perfect vegetables in your pantry. Just peel, cube, and steam the vegetable of choice. 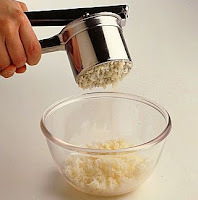 Then mash it, or, if you have a potato ricer (and why not if you don't? ), it's a breeze. I've been experimenting with Rutabaga, Yukon Gold Potatoes and Spinach, or Broccoli, Winter Squashes (Butternut, Acorn, Kabocha), Carrot, Gold Beets, Red Beets, Sweet Potatoes, and Parsnips. The result has been a range of flavors (mild to sweet and earthy), and color (pale green, pale yellow, golden orange, and deep red). I'm working on an article for The Grapevine (Good For You Market's E-newsletter) and my Organic Living column in the E-zine Coastal Sussex Weekly. I'll post photos of my gnocchi, together with a discussion of Gnocchi in a few days when I'm done experimenting and come out of my starch induced high! Spread the word about Good For You Market and our E-newsletter and this blog. This time of year is especially hard for beach area businesses and we need all the support we can get. Help us change the perception that we are an expensive, "Healthfood Store." We're a serious food market that also carries health food. We're cheaper than the big boxes and have better quality food, and rare, 'Foodie' items you just cannot find elsewhere at the DE beaches. Send us a message you value this choice before I give up working like a dog on this business! To follow or read our Blog Curious and Cooking, well you're already reading it aren't cha Blanche?